How will Maine build a workforce for a prosperous economic future? Sarah Hardy (seated), associate professor of mathamatics at the University of Maine-Farmington and Sheena Bunnell (standing), professor of business and economics at UMF and the director of the Maine Health Research Institute, joined colleagues in a roundtable discussion -- part of an April 2010 academic summit at Wells Conference Center at the University of Maine in Orono. 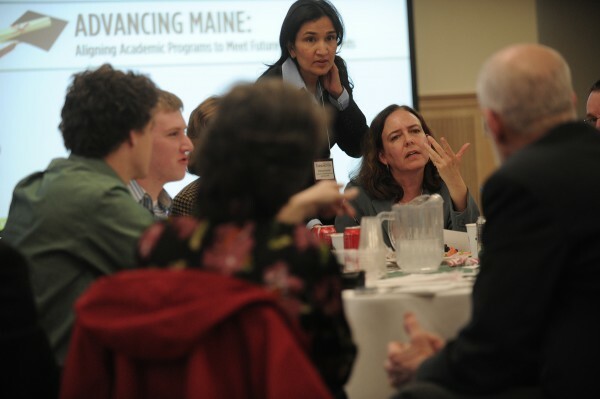 The summit drew campus community from the University of Maine System to assess Maine's future workforce needs and academic program development. Maine suffers from a “skills gap” that stymies economic growth because employers struggle to find trained in-state candidates to fill job vacancies. The most recent Measures of Growth in Focus report, issued by the Maine Economic Growth Council and Maine Development Foundation in March 2012, indicates that the state has made scant progress in areas tied directly to improving the skills of its workforce. Among the areas for concern are per capita income, an aging workforce, low college graduation rates, inconsistent investment in research and development, gender-income disparity and overall wellness. Unchecked, Maine’s skills gap will widen. The Georgetown University Center on Education and the Workforce projects that, within five years, 60 percent of Maine jobs will require some form of postsecondary education. Yet, U.S. Census data show that only 37.2 percent of Mainers between 25 and 34 years old had postsecondary degrees in 2010. Graduation rates for students attending Maine public universities and community colleges stood at 48 percent and 26 percent, respectively, as of 2008, although transfers and other factors skew those numbers slightly. The committee should perceive its mission as engaging employers, educators and workers to create a business plan that assigns each specific responsibilities in closing the skills gap. A crucial first step involves establishing a framework for more direct communication between Maine’s postsecondary schools and employers, according to John Dorrer, program director for Jobs for the Future in Boston. Employers should provide Maine’s universities and community colleges with regular feedback on how well their graduates perform in the workforce. Educators must be open to those evaluations and willing to adapt curriculum to improve core skills, such as quantitative analysis and communication that employers can build upon with their own job-specific training programs. They also must examine why so many students leave postsecondary education programs and whether more targeted career placement exploration before students leave high school would increase postsecondary success rates. Expanding collaborations like the community college system’s Maine Quality Centers, which customizes postsecondary training to the needs of employers who can guarantee job placements, is worth exploring, especially as a tool for small businesses that can’t afford their own training programs. Doing so means making focused private and public research-and-development investments in niche manufacturing and innovation-based technologies such as biomass and tidal energy generation, which offer hope of job creation in rural areas unlikely to benefit by forecasts for continued growth in health care and service professions.